Yesterday I was in my seated asanas and I could hear, between my breaths of course, Sharath’s words in the Shala as he was working with someone. I heard words like; no fear, go back, walk, why fear, go. His tone remains the same and it is just words that he repeats as he has his hands on the student. I glanced up, in between efforts to keep my drishti, although I did not need to at all, as I understand very well the fear, the hesitation and the inability to let go. I am compassionate to myself as well in this area. I worked hard to let go of the fear and to not let anything distract me. This is not easy when you are in the first row and Sharath decides to take a seat on the stage while you are standing up and dropping back. Maybe I’m wrong but I could feel his eyes on me, knowing my mind is now getting in the way. I want to walk in to deepen the back bend and want to let go but feel a lot of hesitation held in the body. The thinking starts as well and the “I can’t.” My breath gets belabored and it’s hard to bring a sense of ease and calm to this back bending process. It’s almost like I’m rushing to get through it and this is actually the area where it okay to stay as I heard a teacher say, “it’s your time.” You finish primary series and things go great and then you come up to this other series, Urdhva Dhanurasana, and it’s like I put the breaks on and then take off doing 120 mph when I decide to do it. You can read about back bending and talk all day about it but nothing is going to get over any fear without doing it. You have to feel it and continue to explore the changes. You have the knowledge about drishi and how your legs should be, positioning of the feet and the arms. You can watch all the videos about it but you have to experience it to gain the knowledge and get over the fear because it will always be there. This practice is about experiencing, it’s about finding the peace in the pose through the breath. I get to drop back twice and Sharath is up standing in front of me so I know my time is up. I try to breathe and back bend with him. I touch down and walk and before I know it I’m up. He was easy on me. I feel like he sees through my desire to be pushed in this area and he wants me to push myself so he stops. He wants me to figure it out. Fear is present when you don’t know. No freedom is coming without experience and true knowledge is learning through experience. It also takes time to know some things, a time to grow and a patience that yoga can teach us. We are all going to look back onto times of our former self when we thought we knew. We didn’t, we didn’t have a clue. I know I didn’t and I am okay to find some humor and laugh. All we can do is be in the moment; doing the best we can with each breath, enjoying the learning process and the journey of this life. I find humor in the things I thought I knew especially when I discover it’s really something else. It’s a build up and there are no shortcuts. Even if you are on the fast track something is going to get you thinking and change you through experience and true knowledge. It’s not ending for me and I am grateful for the fun times on the journey. Everything requires effort and practicing Ashtanga requires, to put it simply, a special effort. Everyone’s journey is different, yet we can compare stories that all start with “I remember when . . . I have been thinking about my personal journey on this yogic path and I surely have not always put forth the right amount of effort. Usually is way too much and not in the right place. When it comes to yoga you have to put in the effort and then it has to be the right amount and also in the right place at the right time. We discussed this in our Yoga Sutra class today and I got to thinking about practice and how I feel today on this trip to Mysore. How do we know what the right amount of effort is? Does your teacher tell you? Is this in the books or can you perhaps learn it in a video? Is it when you can catch your heels or float back, (both I would like to do effortlessly by the way.) This is where I have it all wrong. I have always been a hard worker. I know it is in my upbringing in combination with my temperament that gave me these most wonderful quality traits or Samskaras. They are not so wonderful when it gets in the way of practicing yoga and in my opinion especially when you set out to practice the Ashtanga yoga method. Over time this driven quality set me up for disappointments, frustration and pain. That got in my way earlier this year and a wise woman who teaches in Kentucky said to me today in our brief encounter, “Sometimes we just get lost without a teacher.” How true this is. We think practice can be our teacher and it is without a doubt. We spend a lot of time on the mat working things out and we keep showing up every day to practice. We need feedback, we need to know that we are moving in the right direction and we need proper technique. We also need to know who we are and what we are working with. We have to take account for our limitations and work with them, not against them. I thought I could bypass more hard work and even made up some “shoulds” which I imposed upon myself. There is no schedule with this method, only techniques and practice. You can do it your way or the way it is prescribed. I have tried other ways and I keep going back to how I am being taught today. This year in Mysore I am happier and feel more at ease when I come to the mat. I don’t have these preconceived notions and start judging myself. I have more patience. These judgements can set us up for these stories we have about ourselves. They are not correct as they are only limitations that the minds sets on us. Our bodies limitations are obvious and we work with the proper amount of effort to find out the method and the teachings so that we can practice yoga and then take this into our lives. 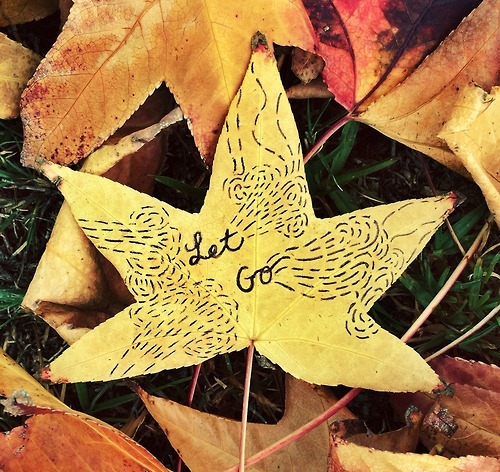 It’s in the putting forth the effort and in the letting go of the outcome that will bring us more happiness and freedom. So it is with an open heart and dedication that I proceed on the journey putting forth the effort where I need it most of the time. I feel calmer and peaceful this trip. I seem to be sporting an inner smile that expresses that I am finally beginning to understand as well as experience what it means about putting forth the proper amount of effort on the mat and in my life. 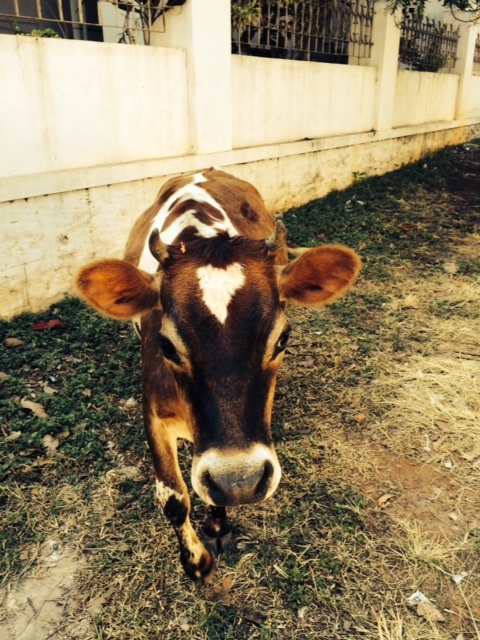 Getting to India is always going to be an adventure and practice at the Shala is meant to take on a life of its own. I’m still in the adventure part of the trip which is annoying as I sincerely want to be settled for my time here. Not sure what happened to the order of the universe and I suppose this is meant to test me further. Test my patience and how good I am at all this yoga stuff off the mat. In any event all these details of getting here and any mishaps do not really matter at all as I got to practice today. My registration card is not that impressive and you pretty much get what you get depending on who you are as well as when you register. Turns out when I thought I was on time or early, I was on the later side of the registration process as it has been going on for days without me. I am happy that it is the beginning of the season and things are fresh. 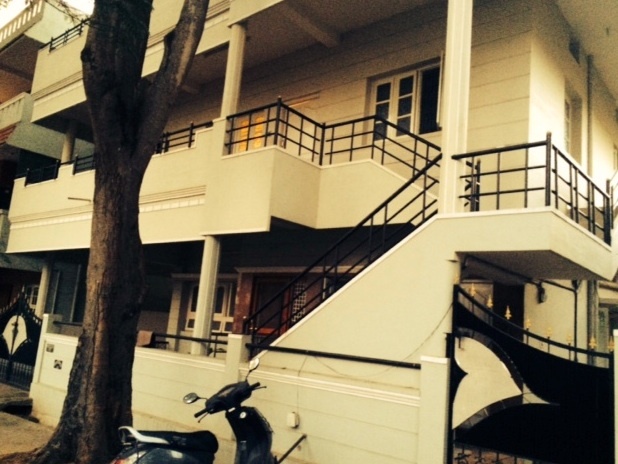 From the fresh paint at the Shala to the lightness in Sharath’s step and the hugs from all the old friends as well as new, both Indian and Western, things are progressing in a sweet direction. I was all set for a crowd this morning for the led class that I was assigned to. Led in Mysore is not my favorite only because of the crowds and getting a spot. I have all these preconceived notions and have already painted the picture in my mind. You see, Shala time is earlier than the regular time and then you have to be earlier than Shala time to secure your spot on the stairs. It’s all somewhat confusing as you have to determine to be early, but not too early. It’s sort of like that Goldilocks and the three bears thing. How to be just right? As I turned into the gate it was weird. Catherine and I were the first ones and we were able to sit at the top step. I could relax as I would not have to negotiate a spot this time. I would be able to get into the Shala almost first and choose the spot that suited me. I listened to Sharath counting and thought, ‘it’s fine we are early but not too early”. The fact is that there is alway a possibility to be called out on it with Sharath saying something or even telling us to leave and come back. Turns out that there were only 15 of us for this Led class today, two rows with space to expand our limbs. We were actually the lucky ones today with an almost private class with the “Boss” as John calls him. Anyway I felt lucky and I was excited to practice. I have been paying attention to the Vinyasa, the count and my breath and I heated up nicely. My breath felt right today and I felt that so happy to have the opportunity to have the Trishtana method to focus on to support me in the practice. All the support was there to do this today. Pieces came together and still you can only do the best you can do each day. He still spoke to us individually as you know somehow in the group when he is talking to you. You make the change and he’s satisfied. No one moves till it’s done. I always say it’s a collective effort in Led and that makes it fun. You hold or stay up and somehow you support your fellow Ashtangi when you do this. It’s in the letting down of the group that sometimes stinks but again we are all doing our best and with a smaller group it is evident when you know it’s you. Chakrasana is a challenge when you are in Led as we all know. Some have an ease that is just beautiful and some go without thinking. So it is in the thinking that I personally get stuck. I have this story every time I get to this transition which is getting old. I worked to let go of this today. Each time that I inhale and hit it, I figure that I’m doing pretty good but the boss kept saying “chatvari” waiting for me to lift up and be there. Tomorrow is led again with our 15 and more coming. “Tomorrow you do”, I tell myself. 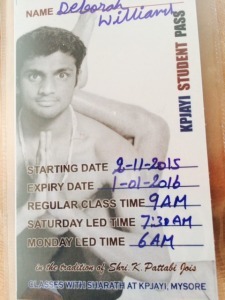 I keep hearing Sharath in the back of my mind as he repeats “Yoga is 24/7”. What does that truly mean and how can we relate to this? We understand that we cannot only be good yogis on the mat and that we need to carry what we learn in yoga into our lives. When we are happy all day and compassionate to others, does that cut it? Does that mean the yoga is working in our life? I suppose it certainly is a start. I like being happy. Who doesn’t ? It’s great to be in a good mood with everything going your way. Unfortunately, happiness is a fleeting emotion and we recognize this. We take the good stuff with the challenges and disappointments. We understand that we would not be able to recognize happiness if not for sadness. I thought about my weekend and plans that a friend was trying to make to reconnect. I thought this would be so nice and then an hour later got another message that it was not going to work out. It’s not like I feel nothing but I’m okay with letting it go and hoping for when it does work out. I remember when I wanted 8 days in the week and I would be happy when (just insert any thought that pops in). It was in the early days of practice when I was a full time working mother and a wife and took up a yoga practice. Life was FULL which is only a nice was to say I was busy. Being busy took me away from me however. Being busy was just a mask to show how accomplished I was and how much I could take on. Always looking for purpose and recognition. One year I was a working mother with 4 year old twins and a new born and took up being the co-president of the preschool. I loved the challenge and thrived on it. I look back on this and say, “that lady was crazy”. I forgive her as yoga did not find her yet. Yoga ruined my life and saved me. Yoga has taught me how to be a more balanced person. It doesn’t matter when we come to the practice or when we find it but it will ruin the old version of you. The version that you thought you were. My version was the person that was run by their emotions. I liked happy and an organized life. When the sad and chaos struck or anything another other than happy it was not very pretty. I see glimpses of this woman and then I come back to the lessons that yoga has been teaching me. How to be the seer and how to let go. Today I meditated with my dad. Five minutes before we did some yoga poses and five minutes at the end of practice. He had some pain so we had to go lightly on the poses and I figured he came to the studio to do some yoga so I turned to sitting and watching the breath. We timed each meditation session and we did it! I have to say that it was one of the best sessions yet. He asked me again, why I do all this. All the yoga, everything yoga. He sort of pokes fun at me and asks again why I need this. I tell him it makes me a more balanced person. He nods and slowly he is understand or accepting. In any event he keeps showing up on the mat and does what he can and even now the sitting quietly with the breath is not a big deal. He is seeing how this yoga can work in his life too at 77. I’m really proud of him and all my students who put themselves out there every day to lead more balanced lives. 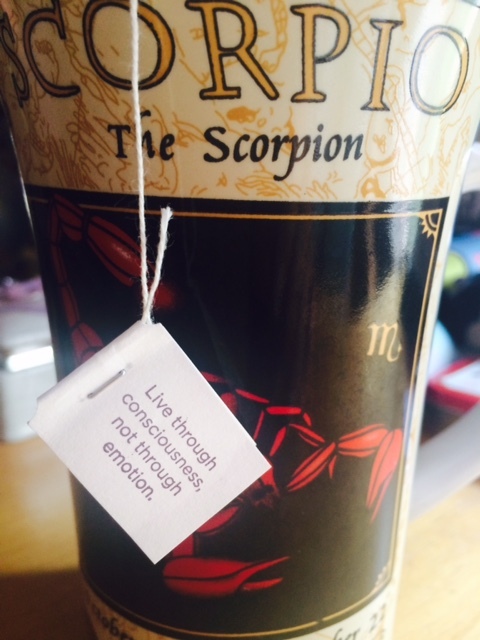 The quote from my Yogi Tea bag from today fits nicely, as always. I have been inspired to practice and encouraged to practice differently these days. It’s been hard to change old habits and to come to the practice with a new set of eyes. To take what I thought was good enough for myself and to expand into new depths of the practice. I started to understand that these self imposed limitations may be just that – self imposed. Could I go deeper, could I get through the discomfort and sometimes pain have been attached to? Was I able to see the light at the other side of whatever I was working on? This yoga practice, the Ashtanga yoga method is a wonderful tool that we have to work towards letting go and controlling the mind and to healing. The breath being the guide and this method of having one prescribed movement with each breath. I thought about what the description of vinyasa is and what we say when we refer to Ashtanga as a vinyasa system of moving with the breath. The key point that one may ask is; What is the harm in taking an extra breath here and there? What about taking our time getting into poses and even getting out of them? We are still moving and breathing. For me, it gave me an opportunity to dwell and to think and to do something besides what I set out to do . . . YOGA. I understood that every time my hand went down to the floor to touch habitually, every time I looked down or I did something else like touch my hair and clothes, that I was just using delay tactics. I was stalling. I always thought that I respected the vinyasa of the Ashtanga method . . . the primary series at least. I may have respected it but I wasn’t doing it. I have been working on actually doing it for a few months now with a teacher. She is a rock and is instilling in me techniques that I am able to incorporate into practice and translate. She doesn’t see or believe in my limitations and only shares in the possibilities. In actuality they are only my self imposed limitations and her strength and “apana” is catchy. The firmness is catchy and after years into this practice I am amazed at the power of the practice to heal. It has been a challenge for me. I knew it was doable and instead of being disappointed in myself because I could not do it, I kept trying. I have to keep reminding myself to let go of judgements and expectations and my thinking. The prescription is the practice. Today I had FUN. It is a continual ebb and flow just like your days at the home, office or studio. Enjoy the ride! Life if simple here in India. I am in a small town in Gokulam just outside the big city of Mysore, which isn’t so big, but there is a lot of activity there. I often go downtown by rickshaw for the adventure. Gokulam is sort of protected but it’s authentic as small towns come. I can get everything I need for the apartment from cleaning supplies to fresh fruit and flowers just a short walk away. You buy what you need. They ask if the bananas are for today or tomorrow just to be sure that they are just right. I love the chocolate man and the coconut stand and of course my favorite place to stop for nuts or juice is the little stand around the corner from the Shala called Guru & Sons. Sometimes they have fresh nut butters and even banana bread. Practice at the Shala under Sharath’s watchful eye is focused. I feel like I am rebuilding my practice and finding it refreshing to see it change. I have to watch the breath as the Shala gets hot and you can heat up fairly quickly. By the time I am at the seated asanas, sweat is strong and even throughout my body. It feels good to get to the floor. It’s also a good time to reconnect and collect yourself, breathing freely with no movement, almost feeling effortless, connecting to those allusive bandhas. I’m enjoying all of the practices here and as usual we learn something new every time we come to the mat. 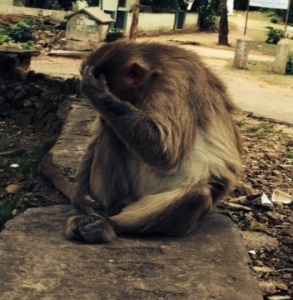 The day before the New Moon, Sharath made a comment that I was stiff and we can blame in on the moon. He knows I’m not one of the bendy people and I’m able to be amused at his comments. Today I felt more open for sure and he says to the assistant, “Have her catch.” He knows I’m not catching so it’s amusing when I am asked which side first. “He’s kidding”, I say and I try harder this time to deepen the backbend, which means; walk, walk, walk, the hands to the feet. It’s fun and after three weeks I feel more confident to keep trying. I’m happy practicing here and I get the feeling that the people coming here become your big extended family after a while. After practice, I look forward to chanting sessions with Laksmisa and other classes. Breakfast spots are fun to connect and chat with other westerners. It can be as quiet or busy as you want it to be. Lunch is the main meal and you can tell by the practice the next day if you ate well the day before. I’m noticing different things about myself. When I feel lonely or tired or sad, I know it will pass. One day I heard a dog crying and looked to see where he was in the small cage under the stairs of a house. Then I saw a woman with a baby begging and I keep seeing puppies looking for their mother everywhere. I love the cows and want to feed them. I love the dogs and want to give them some love. The goats make me smile. I close my eyes and wait for these feelings that get stirred up in me to pass. I’m not sure I could do this if not for the practice. The practice makes us sensitive and the practice also teaches us that you don’t have to be stuck in any emotion too long. I got a new pose today but I didn’t do it today. I get to do it tomorrow. You have to be patient here and just practice. No expectations and do what is required. Hopefully he’s watching. He is watching. Nothing goes on in that Shala without him noticing. If he didn’t see you do a particular asana that you have been working on, you may have to do it again so he can. It’s a beautiful thing how the connection is made to Sharath for everyone. Today I came up from the backbend and there he was right in front of me. I’m stalling as I have to drop back and he stays right there and says, “Go.” I proceed like he’s not even there and I come up continuing in my normal fashion. Finally he says Pashasana tomorrow. It is likely that he knows I am waiting for this day. This is not just any pose but the first pose of the Intermediate Series in Ashtanga yoga. 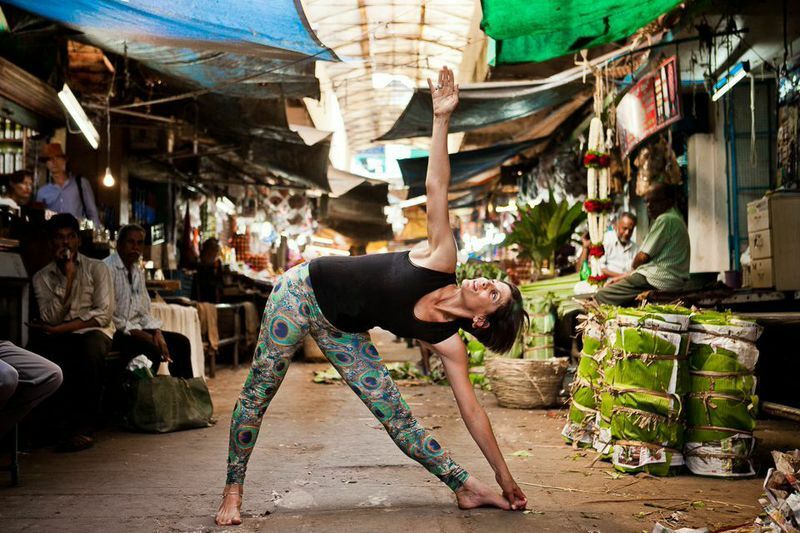 This gateway pose that I have been secretly longing to do here in Mysore. Every time you have those desires that come up you have to try to settle and practice yoga. I’ve struggled and had to figure out how to get there doing what is required. I see people struggle in the practice. I know where they have been and understand the journey that it takes. For me it took time and commitment to it. Kino calls it a project and these projects are supposed to turn into progress. She also helped me to pick one of two projects and leave it at that. The good news is that we want to be encouraged to come to the mat, we want to make it so that we enjoy the practice and we want to make it so that is just challenging enough. I had not felt so challenged here in Mysore doing the primary series, even though I know that I can always work on something. Always. Primary normally feels like coming home but this past week I have had enough. I caught myself having desires, expectations and was becoming impatient. As one would expect, this turned into disappointment. However, grateful to this journey and to yoga, I managed to let it go, to continue to smile, forging ahead. I managed to continue to come back to practicing yoga. C-Ray says that you can’t control your thoughts but you do control your thinking. This relates to the understanding that we have a choice as to how we are going to react in any situation. 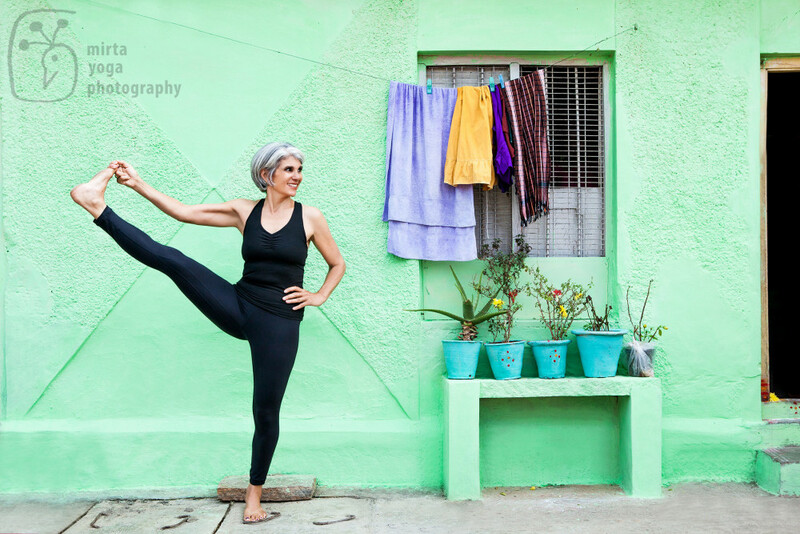 What happens on my mat and in the Shala is no different to situations in our lives. The tools are there for us. Tomorrow I continue to do the Primary Series and I get to move into Intermediate! I have to admit I am very excited about this. It’s perfect timing actually and now I get to “think”of something else beside Pashasana! I tried, I really did try to keep focused and practice today. I had a nice spot in the middle of the room and as I started to practice I noticed my mind wandering. I continued to bring it back to my breath and then I remembered to use the drishti, but my drishti keep going. I was not steady today. I even had weird thoughts like I wonder if he would notice if I stopped after Navasana? What if I just rolled up my mat right now? Then I had this conversation in my head that Sharath and I would have. So you see crazy monkey mind? I figured stopping at Navasanna was not an option for me anyway. It probably would only be to get his attention. Maybe that’s what students do? “Hey _______ , I’m going to stop after Navasana . . .” and the conversation continues just so the student can get to talk to the teacher. Could be? I decided to continue to try to focus. I remember that the breath could help and although in the asana I could stop and focus and breathe, it was in the transitions that my mind took over. Supta was done properly (which means it felt just right) and then there I am hanging out in Bakasana. So there I am with my “Bakasana looking good” . . . BUT you don’t hold it there! Again I’m thinking jump back or no, step or go. I’m hanging out for a breath or two or three too long . . . thinking. Long enough to get noticed. It’s important to be efficient here. I take time in backbends, too much time, so the rest has to be efficient. I’m trying. 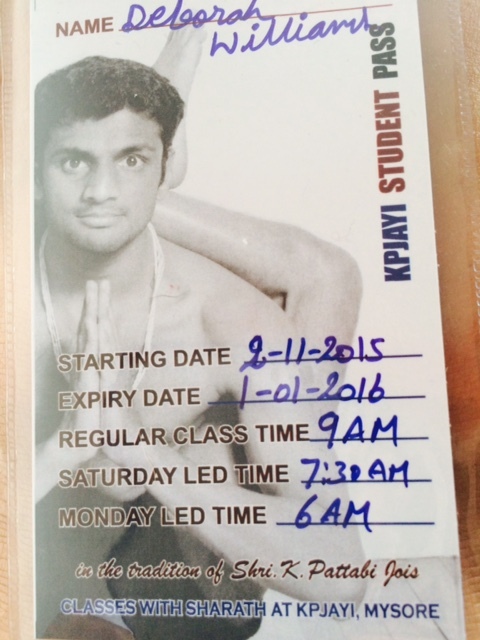 So the mind continues to try and take over the practice and getting to backbends, I get to meet Sharath. My breath is not that great at this point. I do my three drop backs and he jumps off the stage. I’m sensing a system as assistants are mulling around. It’s actually in the timing maybe. He’s easy on me today and I do the walk, walk, walk with my hands and they don’t go too far toward my feet until I’m up. It’s fun. I’m excited to keep doing the work and I’m up for that. I have heard that before in things I have set out to do. “Are you are up for that?” The mind has to help get you here and the breath will lead you to the tools to bring you to yoga. Tomorrow is Led. I am not overly excited it’s led for the possibility of not getting a spot or better yet being in some far off corner, which may not even be in the main Shala. Therefore, with no expectations I will take what I get. I will take action, however, and try to get in just like everyone else. When I face challenges, I’ll just remember to breathe before I take each action and smile when I gently move a mat or two to make a space for my mat. I’m glad that I’ve been here before. When you have been somewhere before there is a level of fear that just goes away, disappears and it’s like you’ve never been fearful before. I mean when you get to India and you don’t have the right address of where you are staying, you could start to panic. Picture this, you’ve traveled for days, you ate so you aren’t hungry but you’re tired, not only are you tired, but you LOOK tired and just want to unpack but since you have the wrong address you . . . have a coconut. Good thing I paused and had a coconut as I saw a friend come out of the Shala. There are lots of people coming out after practice but I call out his name and we chat. I tell him my story (at this point I just figured my driver was not all there and that I had a good address) He helps with internet access. Long story short, I was around the corner from where I needed to be. It’s a combination of not being fearful, having some trust in some people (Mahesh watched my bags – I took the rupees out), and being able to pause and stay in the moment. To pause, to think and to breathe. I spent some time settling in after this, which also means to pause. Lots of things are different so you have to take your time, think and figure things out from light switches to locks to heating the water for the shower which seemed pretty important to me. Communication is not always easy but everyone smiles and somehow you start to understand each other with gestures. They are speaking their language and you are speaking your own, in sometimes a louder tone than normal, like they may understand you better. The registration was uneventful which is good. Sharath is busy with a big line forming and I’m glad he sees me here, takes my fee and gives me my start times. I’ve been here before so I’ve got everything ready. Checked my list and checked it twice. I’ve been here before and it’s all pretty familiar. Led class is at 6 am and now “Shala Time” is 15 minutes before the actual time (last time it was 20 but I can handle this). I’ve never been able to figure out how to get into the room before the rush so of course there is no obvious spot. So I pause, but not too long, and because I know the drill, I know that there is very little space between mats during the led class. I see these mats in a row with some luxury space around them and make a move to “create” a space for my mat. It would have been done anyway and I got a nice spot near the alter on the far side of the Shala. So for now I avoided the changing room and the stage but I’ve got a few weeks left. Once my arms went up for the first sun salutation, I had a sense of ease around the practice that’s been missing. I held the counts and focused on breathing. It was fun! Today for practice you get called into the room and there is absolutely no reason to worry, everyone will get to practice. I feel pretty relaxed about this BUT you can’t choose a spot, it’s chosen for you as people finish you become the “One More”. So I’m the one more and he doesn’t ask for my card and I get to start my practice. My only wish is that I feel good and that I continue to work on having some ease with the practice. The pause I felt in the practice was in between the breaths and this makes practice just delightful. I keep going and keep breathing and I take my time and get to the end feeling grateful. Grateful that I am able to move with ease, that I can hear my breath and that my breath is giving new energy and life to my practice . . . just for today.